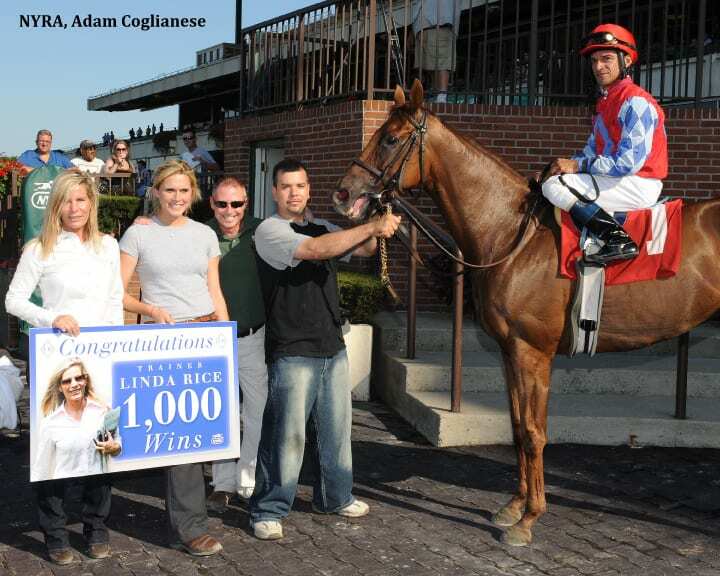 ELMONT, N.Y. – Linda Rice, who made history at Saratoga in 2009 when she became the first woman to win a NYRA training title, reached a personal milestone in Sunday's ninth race at Belmont Park when she saddled her 1000th winner as a trainer. With the triumph, Rice will finish the Belmont spring/summer meet tied with Todd Pletcher atop the trainer standings with 25 wins. It's the third meet title for Rice, who tied with David Jacobson this spring at Aqueduct Racetrack. The victory appropriately came with Sextant, a 6-year-old mare owned by her father, Clyde Rice, a former trainer. Rice was born in Wisconsin and grew up in Pennsylvania. She studied computer science for two years at Penn State University but kept her hand in racing, working for her father whenever she could. She took out her trainer's license in 1987 and was initially based in New Jersey, where she saddled her first winner, Contraboss, at Garden State Park. In 1991, she moved her operation to New York and that year won her first of more than 100 stakes, the Bernard Baruch, with Double Booked. Rice joins an elite group of female trainers to have reached the 1,000 win milestone, including Stephanie Beattie, Christine Janks, Barbara McBride, and Kathleen O'Connell. It should also be noted that training under the name of Linda Rice-Appleby, she compiled a record of 21 wins, 12 seconds, 15 thirds, and earnings of $433,967 from 102 starts during 1988-89. All together, she currently has 1,021 wins, according to statistics provided by Equibase Company. Although many of Rice's accomplishments have come on The New York Racing Association, Inc. (NYRA) circuit, in 1998, the trainer saddled Tenski to win the Grade 1 Queen Elizabeth II Challenge Cup at Keeneland. That year, Rice also sent out Things Change to win the Adirondack and Spinaway Stakes at Saratoga Race Course; in 2000, she sent City Zip out to sweep all three of the Spa's graded stakes for 2-year-old males: the Sanford, the Saratoga Special, and the prestigious Grade 1 Hopeful. More than half of her 1,000 wins have come on the NYRA circuit, with 236 wins at Aqueduct Racetrack, 198 wins at Belmont Park, and 120 wins at Saratoga. This entry was posted in People by Paulick Report Staff. Bookmark the permalink.